The town's name derives from the rainbow-coloured sand dunes surrounding the settlement. According to the legends of the Kabi people, the dunes were coloured when Yiningie, a spirit represented by a rainbow, plunged into the cliffs after doing battle with an evil tribesman. Much of the sand colours stem from the rich content of minerals in the sand, such as rutile, ilmenite, zircon, and monazite. A black dune of ilmenite sands, overgrown by dune vegetation, can be found north west of the main town. This is currently being removed for sale in China with complete removal expected to take two years. The Cooloola Section of the Great Sandy National Park borders the town to the south. A number of walking tracks through the national park depart from the southern outskirts of Rainbow Beach. This includes the northern end point of the Cooloola Great Walk. 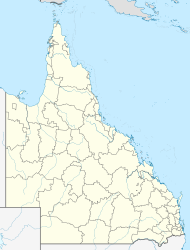 By road, Rainbow Beach is located 75 kilometres (47 mi) from the Bruce Highway town of Gympie, and 239 kilometres (149 mi) from the Queensland state capital, Brisbane. Originally known as Black Beach, Rainbow Beach was renamed after the coloured sands located near the town which lies to the south of Fraser Island on Wide Bay. It was gazetted as late as 1969 when it was established to service the local sandmining industry. Until that time there was no road to Rainbow Beach, with the only access being via boat from Tin Can Bay. Sandmining ceased in 1976 and the economic focus changed to recreation and tourism. The Singaporean-owned Cherry Venture a 1600-ton cargo vessel was empty when it grounded on 8 July 1973 during gale force conditions. The freighter was bound for Brisbane from New Zealand and floundered in the heavy seas and gale force winds. The anchor cable had parted in the 12 metre seas as the Captain had attempted to hold the ship into the wind. Several unsuccessful attempts were made to refloat her, she was then stripped of her fittings and left to the elements. Up until 2007 her rusted hulk was a major tourist drawcard and even boasted its own ice-cream vendor. The huge stainless steel propeller was taken off the vessel and is now on display in the Laurie Hanson Park, which overlooks the beach at Rainbow Beach. The town's war memorial commemorating those who died in the World War I and subsequent conflicts was refurbished in 1993 and is also located in Laurie Hanson Park. Rainbow Beach Library was opened in 2012. The town's economy is now dominated by tourism, featuring quiet and idyllic holidays, fishing and retirement getaway. The town caters to beach-orientated holiday-makers with hotels, motels, and caravan parks. The town promotes itself as the "Gateway to Fraser Island" as vehicular ferries for Fraser Island depart from Inskip Point, north of town. Double Island Point, a popular destination amongst 4WD enthusiasts, is located east of town. It is also promoted as an eco-tourism destination. Although it has a permanent population of about 900, about 70,000 visitors come to the town each year. Gympie Regional Council operates Rainbow Beach Library at Rainbow Beach Community Hall, 32 Rainbow Beach Road, Rainbow Beach. In 2011, a large sinkhole consumed much of the beach at Inskip Point, with the hole size estimated at 100 m+ long and 50 m+ deep. A large sinkhole opened up near Queensland's Rainbow Beach, affecting campers along Inskip Point in September 2015. Fishermen were the first to notice the shoreline quickly receding into the ocean around 10:30 pm, the Brisbane Times reports. Casey Hughes told ABC news it sounded like thunder as the sinkhole was opening. The sinkhole was 150 metres long, 50 metres wide and three metres deep. The sinkhole swallowed up one car, a caravan, a camper trailer and several tents. 140 people were evacuated from the campground, but no injuries were reported. Most of the campers were able to move their vehicles out of harm's way before their campsites were submerged in water. ^ a b Australian Bureau of Statistics (31 October 2012). "Rainbow Beach (State Suburb)". 2011 Census QuickStats. Retrieved 21 October 2014. ^ Hues of a rainbow Archived 15 April 2006 at the Wayback Machine, Sydney Morning Herald. Retrieved 30 August 2006. ^ Travel: Rainbow Beach Archived 15 April 2006 at the Wayback Machine, Sydney Morning Herald. Retrieved 30 August 2006. ^ Jo Skinner (29 March 2010). "$1.3m Cooloola Great Walk opens". ABC News. Archived from the original on 17 November 2010. Retrieved 22 July 2010. ^ "Rainbow Beach War Memorial". Queensland War Memorial Register. Queensland Government. Archived from the original on 31 March 2016. Retrieved 20 July 2016. ^ "Public Libraries Statistical Bulletin 2016-17" (PDF). Public Libraries Connect. State Library of Queensland. November 2017. p. 13. Archived (PDF) from the original on 30 January 2018. Retrieved 31 January 2018. ^ "Rainbow Beach Foreshore: Park Development Plan" (PDF). Gympie Regional Council. Archived (PDF) from the original on 20 August 2016. Retrieved 20 July 2016. ^ "Rainbow Beach Library". Public Libraries Connect. State Library of Queensland. 27 April 2017. Archived from the original on 31 January 2018. Retrieved 31 January 2018. ^ (27 June 2011) Georgia Waters.Sinkhole swallows south-east Queensland beach. ^ a b "Sinkhole swallows car, caravan at campsite near Queensland's Rainbow Beach". ABC News. Australian Broadcasting Corporation. 27 September 2015. Archived from the original on 11 March 2016. Retrieved 5 March 2016. Wikimedia Commons has media related to Rainbow Beach, Queensland. This page was last edited on 7 January 2019, at 22:03 (UTC).